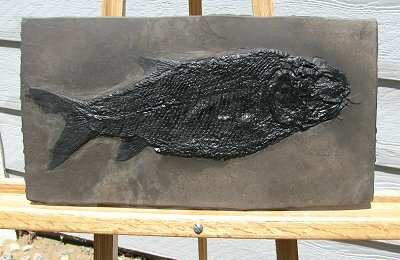 This is an incredible fossil fish. It is a fabulous Sinoeugnathus fish from the Keichousaur site in China. This specimen is HUGE (a full ELEVEN inches long!) and has ultra-superb detail. The entire scale pattern is preserved (very rare), and the fins and tail are even intact. This specimen was prepared by hand, not air abraided, so the detail is 100% natural. Under magnification, the scales show their tiny barbs, and the eye socket is even intact! The fish is almost perfectly centered on the large, rectangular plate of matrix. This is easily one of the best quality examples of this type we have ever seen, and also one of the largest. This is a fantastic example of this rare Triassic fish with scales preserved.